You are not logged in. 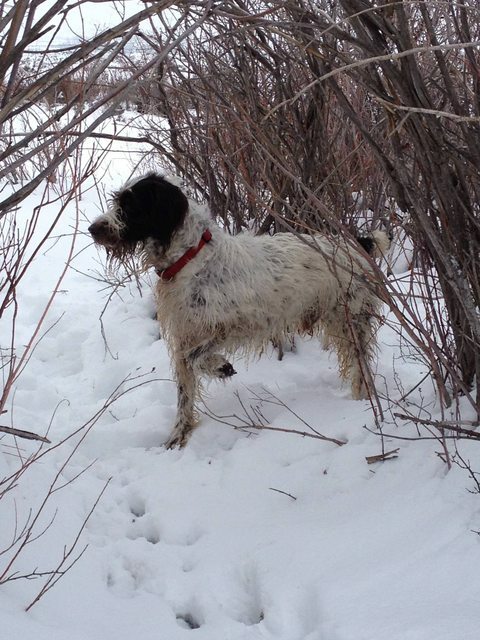 [Log In] Home Forums Gun Dogs How do you know when a GWP is on point? #13423838 - 01/05/19 How do you know when a GWP is on point? No classy pointing here. No front foot in air, they just freeze. 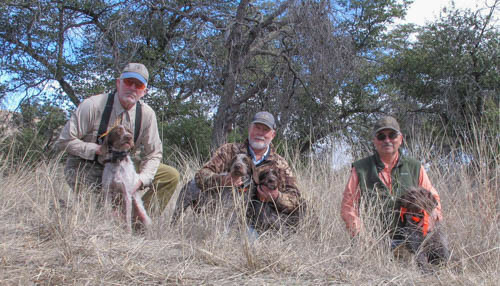 Mearns quail hunting at its best. Some snow to cool the dogs yet warm enough for shirtsleeves. I told Ken to get in there! Last edited by Azshooter; 01/05/19. Looks like tough shooting depending on the direction they fly. Not really into style lol. Those dogs just get it done. Mine was working hard on roosters last week. Love watching them work. Yes it is hard to hit them as the entire covey rises at once. It adds to the confusion with the cover and trees. They tend to go through any trees or run around the tree and fly from offside and usually go upslope. Some planning can put you in position to intersect them as they fly upslope. Many a time had to shoot through branches which often gets you a bird. Then if you want that limit you have to follow the birds upslope. It is a special moment when you can get a double. With an autoloader you can sometimes get 3 on the rise. Then get ready for a late flyer or two. I have chased a covey upslope then returned to the original place where they flushed to have one fly up. 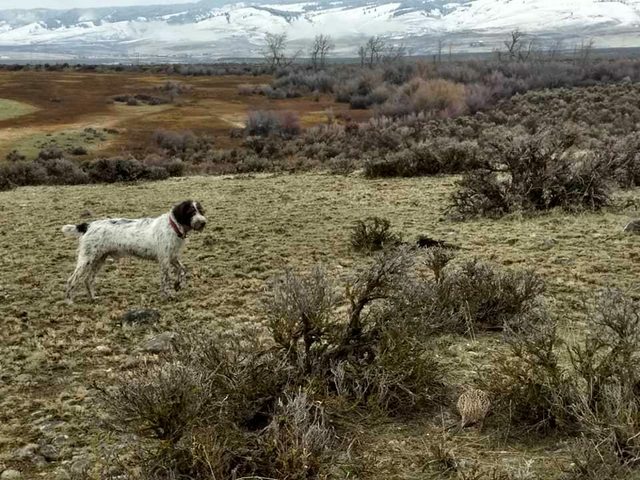 Mearns hunting is best done alone and with one dog if possible. Then you can swing in any direction. I either let someone else make the approach or two of us will go to the pointing dog side by side KNOWING where all dogs are located. Isn't it fun to watch the dog follow a scent trail, then loose it and circle till it is found again? I agree it is worth the hike to see the dogs work, even if you don't get a bird. Great pics! I hear ya on the lack of a "pretty" point. 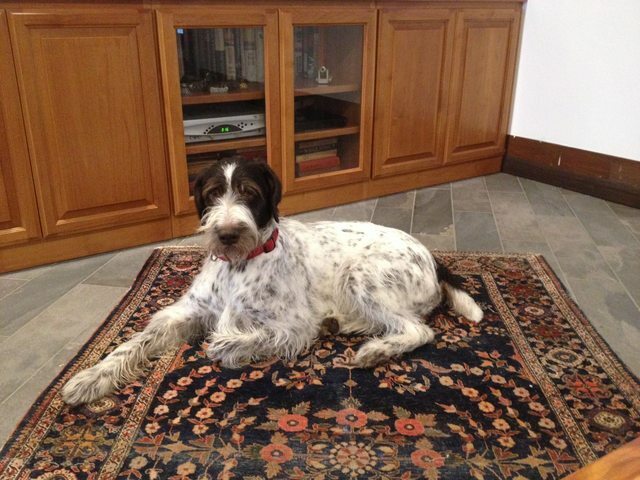 Hank, my pudelpointer, is the same way. Finding birds is really all that matters to me. My GWPG only gives a classic point about half the time. He’s a bird finding machine so I’m fine with him standing still and staring at the ground as long as there are birds. Hard to see dogs pointing. Discovered this untouched area recently. Hunted it two days ago. Found two coveys of mearns. Looking forward to going to it again. There is enough land for at least four hunts of 4 hrs each. 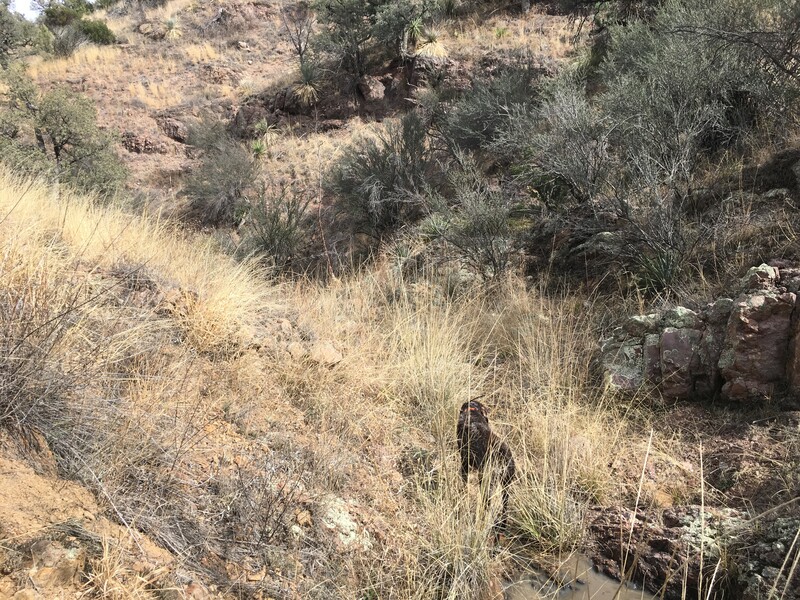 It is rare to see the grass so deep as grazing is allowed in much of the National Forest in S. Az. Last edited by Azshooter; 01/31/19. Love seeing your pics of the terrain, cover and dogs. Looks like a lot of up and down in that area. And it looks very birdy from the pics. Today is our final day here, but thinking we've done enough. Your pics do my soul good. Have a good rest of the season. I enjoy dogs that point, regardless of foot in the air or not. There is just something primeval about the partnership of dog and man, in pursuit of prey. I once had a beautiful Kleine Munsterlander that did the classic raised paw point, and she pointed anything, didn't have to be a gamebird. When I walked her in a city park during summer, I had to carry a stick to beat off the hordes of women coming up to me when the dog was pointing Robins or butterflies. 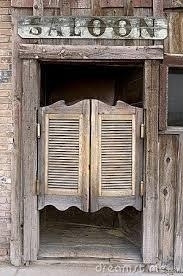 They look just like my WPG Rosie on point...wish I had a photo. I love it when a dog just freezes on point. That's Class to me. Even before any training, you get an idea what the future holds. Most peoples' lives pass them by while they're making grand plans for it. Ken, Like your dog's coat! That's puppy hair. He was only nine months old when that pic was taken. Now he is hand stripped only. Couple of years ago he was locked up so tight on a pheasant in this small stand of brush! I walked all the way around the brush pile twice, and eventually went in and started pulling branches off the ground. That rooster had buried himself under the brush. I couldn't find him for the longest time, but ol' Clark just stayed glued on him. The dog KNEW that bird was in there. I wasn't so sure, but trusted him. Was quite the crazy flush and shot when the bird took off not two feet from my face! Normally he doesn't lift a foot. Just sometimes. Kinda cool when he does, but mostly he just locks up, pointing his nose right at the bird. 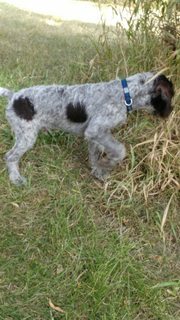 We're done public land hunting until next season, but I can still get him out to the pheasant club this month and next. Too danged cold right now! I think it's 8 degrees this morning here in central Washington. He's ten years old now, and loving life. Great thread. Well done to all. Clark sure looks regal. His good looking coat is so long with nice ticking. What is his weight? Last day of season. These four dogs are all from same sire and dam. The oldest is Asa @ 5, then Scout @ 4, then the litter mates Oli and Sarah @ 2. Pic: left to right. Ken with Sarah, me with Asa and Oli and Web with Scout. We found two coveys and shot a few birds. 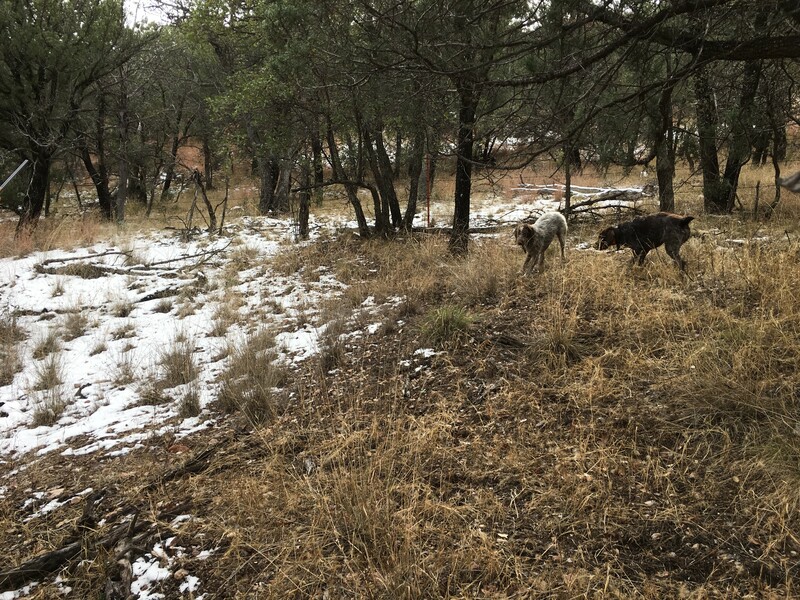 We had running water and cool conditions hunting near Kentucky Camp in Santa Ritas. 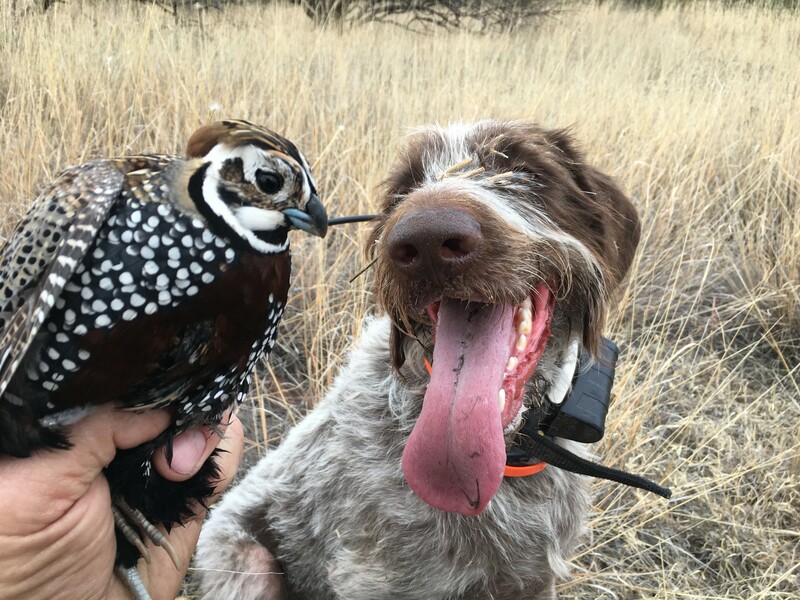 A great way to end the season with friends and their dogs. Last edited by Azshooter; 03/03/19. Great pic!! Very fun country to spend the day following dogs in.